November 29 is a significant date in Jewish history. 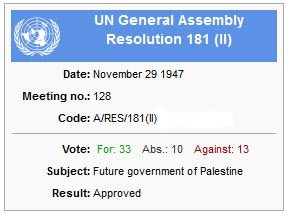 On November 29, 1947, the UN General Assembly voted in favor of a resolution, which adopted the plan for the partition of Palestine, recommended by the majority of the UN Special Committee on Palestine (UNSCOP). 33 states voted in favor of the resolution and 13 against. 10 states abstained. The UN Committee reached the conclusion that the Mandate for Palestine should be terminated, and most of its members recommended the establishment in the territory of Mandatory Palestine of an Arab state and a Jewish state, while internationalizing Jerusalem. The partition map proposed by UNSCOP allotted the Jewish state only a small part of Western Palestine. Despite this fact, the Zionist Organization and the institutions of the Jewish community in Eretz Yisrael agreed to accept the plan, since it recognized the right of the Jewish people to a state and not only a “national home” as stated in the 1917 Balfour Declaration and the 1922 Mandate for Palestine.